When I was looking at the LKSD technology policies, I saw that number one was the fact that the school wanted to give reliable internet access to all of its 26 sites. In a school district the size of Pennsylvania and with a scattered population between our site of 15 students and the biggest site of 300 students, it might be quite challenging. On the teacher and school site part, I see a lot of internet issues related to sites blocked because they are “inapporprite social media or video viewing sites”. We do have internet access, but our access is limited because videos are blocked. We also have server problems at site that slow access a lot of the time(LKSD, 2013). Our district policy also includes having technology as a classroom for students. The district has put in a lot of funding for teachers to have video conference classes for HS students to participate in classes that might not be offered at site because some sites have only 2 certified teachers to cover the whole school. The use of this technology and the upkeep is pretty expensive. We have to work with the local internet service provider, GCI to take care of the connections and it works most of the time. This coming school year, our HS students are taking a required science class and Algebra 1 and 2 at site. It is beneficial for our school district, but I wonder if online classes would be better in a blended learning environment if the teacher can help with instructing as the students move through their classes. It would be interesting to compare the sustainability of online classes versus the video conferencing we have now (LKSD, 2013). Another policy of our school is to use technology to help with professional development. The district streams all training so that it can be accessed in the future through an online wiki site. I think it works well. I have taken training sessions targeted to my individual needs and there is a myriad of choices to cover K-12 as well as administrations classes (LKSD, 2013). After looking at the Alberta website and seeing the blocked sites, I think I would like to include policies that open up the web sites that are currently blocked, but provide an extra acceptable use policy that includes educating students as well as staff about what kind of technology we can use to the advantage of our student centered learning. The vision from Alberta is what I would add to our policies for having more access to educational websites for student centered classroom use. I would include that in the acceptable use policies, that our job is to create a classroom environment that benefits the student in learning through the use of media, music, and pictorial explanations in technology. I would include for teachers to use the technology in an ethical and appropriate way for the use of education to further student understanding. 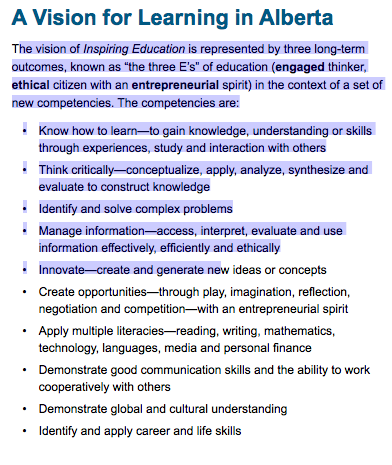 These three E’s: engaged thinker, ethical citizen, and entrepreneurial spirit are clear guidelines to an acceptable use policy in my opinion(Alberta Ministry of Education, 2013). Blocking websites does not help in teaching our students to use technology to our advantage. Winske (2015) says that encouraging the use of technology makes us responsible to create a safe learning environment for all students. This raises other questions we have to think about, like “Should you allow devices from home on your school network? Should certain websites be blocked? What role does social media play? How do you prevent Cyber bullying?” I think that an acceptable use policy has to include education on the part of the school district and training for the teachers and students to learn to be respectful engaged, ethical entrepreneurs! My hope for my school district is that more bandwidth is used, more education on appropriate use, and allowing us the full use of media for educational purposes in our ever changing technological advances that connect even the most remote sites to the rest of the world. Alberta Ministry of Education (2013). Alberta learning and technology policy framework. Retrieved from http://www.education.alberta.ca/LTPF. Internet speed and bandwidth are key issues in our rural students’ inability to utilize much of the technology available to students in Anchorage and the lower 48 states. Part of why many schools block social media sites and video streaming is because it places such a burden on speed/bandwidth; blocking allows bandwidth to be used for activities such as video-tele-conferencing and assessment. At least that is one reason why my former district gave for limiting access to such sites. I definitely agree that it is especially important for our physically remote students to feel connected to the rest of the world. Providers like GCI can’t be expected to invest in infrastructure for such small returns as your site statistics suggest would be available. I think the teachers in rural Alaska are going to have to help parents and employers see how important it is to develop global perspective in our children. We will need to seek funding from local sources such as tribal entities and future employers for increased internet access similar to the Alberta SuperNet (always clear such actions with administration first). Goodness knows the state budget will not provide such funding!